An attractive deciduous shrub to small tree, Chitalpa x tashkentensisis is long flowering and produces pink trumpet like flowers in summer. It is reasonably drought tolerant once established and can be pruned to keep in shape or left to grow into a small tree. This is a hybrid between two species, Chilopsis linearis and Catalpa bignoniodes. A number of cultivars such as ‘Morning Cloud’ and ‘Pink Dawn’ are available for sale from specialist nurseries. Yellow autumn foliage is an added attraction. Chitalpa x tashkentensisis will reach 12m in ideal conditions. Flowers are trumpet shaped and remind us of those of foxgloves, and as they appear through our hot summers all of the cultivars make useful additions to the garden. This is an excellent tree for dry conditions, a little care and water until established and then this is a drought tolerant low maintenance tree. Grows well in both inland and coastal areas although not in tropical climates. 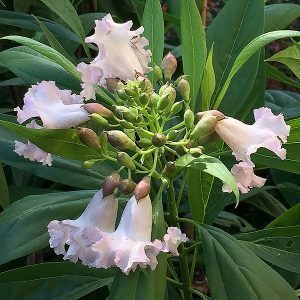 The large flowers are held upright and are attractive over a long period, the plant being a hybrid is sterile, so no weed problems with this tree. Water through the first summer, once established little extra water will be required.